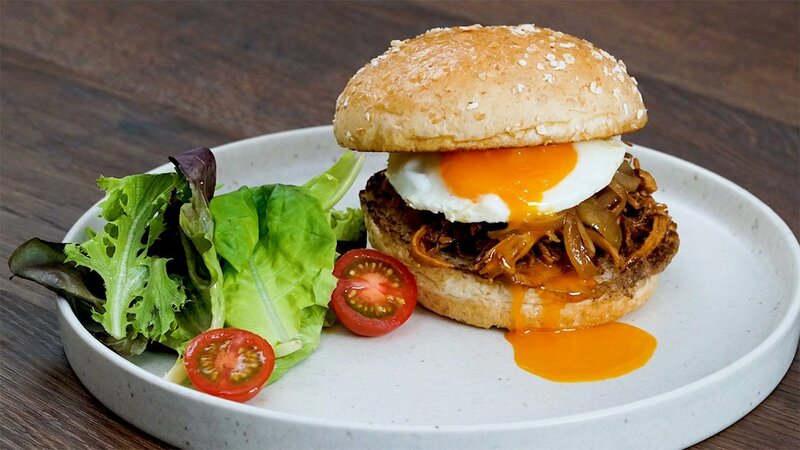 The elements of this hearty sandwich include healthy whole wheat bread, flavorful Korean Bulgogi chicken shreds, caramelized onions, and a sunny side egg that oozes liquid gold when cut open. In a pot, add in your chicken breasts and cover it in water. Season with KNORR Chicken Seasoning Powder and Pepper. Bring to a boil over medium to high heat, then reduce the heat and cover it. Let the chicken cook through for 10-15 minutes, depending on the size and thickness. When cooked, remove the chicken, shred it with a fork, and set aside. In a large frying pan, bring the heat to medium. Add in your sugar and stir until it begins to caramelize or become slightly sticky. Be careful not to let the sugar burn. Pour in the Soy Sauce, KNORR Lime Powder, KNORR Demi Glace, Sesame Oil, Garlic and Ginger. Mix until all ingredients are combined. If the sauce is too watery, make it sticky by adding a slurry of Cornstarch mixed with water. Be sure to mix them in a separate bowl before adding it in the sauce. Add in the Shredded Chicken and Sesame Seeds and combine it with the sauce until fully coated. Cut your whole wheat bun in two and lightly toast them. Place your shredded Bulgogi Chicken on the bottom bun. Top with caramelized onions, and a freshly cooked Sunny Side Up Fried Egg. Cover with the top bun and serve.